James Walter Carter was born in Aiken,South Carolina, on December 15th 1923, but when he was aged nine the family moved to New York. Jimmy first learned how to use his fists on the tough streets of Harlem and, fortunately for him , was able to channel that aggression more positively when he joined the Catholic Boys Club at a local church. It was here that Carter took up boxing and he made his amateur debut at the age of 14. The club made a lasting impression on the youngster and, when he returned to the church as world champion in 1952 Carter gave the parish priest a cheque for $1000 towards the cost of a community centre for the area. In 1943 carter joined the army and boxed in many Service contests while serving as a sapper in England, France and the Philippines. He was demobbed in 1945 and took a job as a grocery clerk before deciding to turn pro under the guidance of Willie Ketchum, a well known and long established manager in New York. The partnership was to continue to the end of Carter’s career. Ketchum believed in keeping his boxers busy and Cater had 22 fights in his first 12 months as a pro, winning 18 and drawing one. It was a promising start and by the end he had fought his way out of the six rounder bracket and was topping the bill on shows at the small fight clubs which abounded in New York at that time. However it was success at a price as the New York managers were reluctant to risk their protégés against him and he was forced to go on the road to find work. Carter’s first trip was more significant than either boxer realized at the time as he travelled down to New Orleans to fight local lightweight star Joe Brown, and lost a 10 round decision. Brown and carter would each go on to become major figures in the divisions history. At the time it was seen as a routine job for both men. After two more wins Carter fought a tough 10 round draw with second ranked featherweight Sandy Sadler, but after three more wins his form slumped as he went four fights without a win, having three draws and losing on a cut eye to Cabey Lewis in November 1947. It was the first time in 34 fights that he had failed to go the distance, which would not happen again until September 1956. Carter came through the bad spell and spent a busy 1948 criss crossing America for 14 fights, winning 11 and drawing one. A return visit to New Orleans did not bring him any luck as bobby McQuillar, a world ranked contender, outpointed him. However in those days the occasional defeat was not seen as the end of the world. Few fights were televised and losses in fights “on the road” could easily be dismissed as home town verdicts. It was much the same story in 1949 with appearances In Detroit, New York and California, where carter scored an impressive eighth round win over Mario Trigo. He had finally edged into the world ratings, but with major fights still eluding him, Carter headed for Australia. His first fight in Melbourne, in September, brought another defeat as Norman Gent outpointed him over 12 rounds, but a month later he knocked out Charlie Ashended in Sydney, and finished his three fight tour with a decision over Bernie Hall in Melbourne. Back in the USA Carter opened 1950 with the first of his three meetings with Walter”Bud” Smith, the man who would in time end his championship career. They met in Smith’s home town of Cincinnati, and Carter proved a shade to experienced for the 21 year old. He won a ten round decision, but fights were hard to come by and Carter boxed only twice more that year. Beating Jesse Underwood and being held to a draw by Tommy Campbell. A world title shot seemed far away when Carter lost his first outing in 1951 to Calvin Smith in Philadelpia – then, astonishingly came the call to fight the Ike Williams for the world lightweight championship. Williams was only 27 but a long, hard carrer was beginning to take its toll. He had been an outstanding champion but it was no secret that Williams was finding it hard to get down to the lightweight limit.Even so, the Williams camp were so confident they neglected to include the customary return bout clause in the contract. The national Boxing Association thought so little of carter’s chances that they refused to recognize him as a contender. Little more than 3,000 fans were in Madison Square Gardens in May 1951 to see the title change hands. What the crowd witnessed was a one sided contest as Carter, a comfortable two pounds inside the 9st 7lb ( 133 lb ), dominated the weight drained champion, who came in exactly on the limit. Williams was down twice in the fifth round, once in the 10th and again in the 14th as the referee Petey Scalzo, former featherweight champion, signaled the end when the champion went sprawling for a fourth knockdown. Williams said some years later that his manager, the notorious Blinky Palermo, had offered him $50,000 to lose, with a guarantee that in six months they would fight again with Williams winning. “ I should have taken it, but I didn’t” he said. “ That’s one of the reasons I’m broke now”. Such arrangements were not unusual at the time, but there is no evidence that Carter was aware of this. Carter had won the world title in style and the NBA had to make a humiliating climb down after the fight and acknowledge the new champion. Although he was the new champion Carter was still a hungry fighter and keen to keep himself as busy as possible. His purse for winning the title was$1,270 and he used this to move his wife and 2 year old son out of Harlem. To keep cash coming in he took on a series of non title matches, beating such as Enrique Bolanos, Del Flanagan and Mario Trigo. However a split decision against Art Aragon in August 1951 earned the Californian golden boy a November rematch with Carter’s world title at stake. Carter gained revenge for his earlier defeat with an emphatic points victory. It was an impressive close to the year for the lightweight champion, but he began 1952 with near disaster when he gave Mario Trigo another chance to test him over ten rounds in Philadelphia . It was an appalling fight, so bad the referee had to warn both men that if they didn’t start trying they risked being disqualified. In the interval, between the 7th and 8th rounds, the Pennsylvania Boxing Commissioner, Ox De Gros, went to both men’s corners and told them that their purses would be withheld if they didn’t show some effort, and that was enough to spark Carter into life over the last few rounds to take the decision. In February Carter outpointed Alan McFater over the unusual distance of nine rounds, and then, in March, he edged a split decision against the number two contender Luther Rawlings. It was anything but the ideal warm up for his title defence less than three weeks later in los Angeles against Lauro Salas. Salas was an unranked, rugged Mexican brawler and he gave Carter an unexpected tough battle. The champion did not trouble him until the 15th and final round, when Salas was put down for a count of four. The judges were unanimous in Carter’s favor, but Salas had done well enough to earn a rematch which took place in May. Carter was a 4-1 favorite for the return but after the 24 year old Salas won a split decision Carter accused his opponent of packing the hall with partisan supporters who cheered his every move and swayed the judges into believing that Salas was having more success than he actually was. A third contest was arranged and the pair met in Chicago, in October. This time Carter took a comfortable verdict to regain the title, but he showed anything but championship form as he won only one of his next four fights, all being non title contests. This did little to encourage confidence in his chance of retaining the title against the hard hitting Tommy Collins whom he faced in the challenger’s hometown of Boston in April 1953. The fight which was screened live on TV was an appalling mismatch which did serious damage to boxing’s image. The challenger, too brave for his own good, was permitted to absorb one of the worst beatings in title history, while the referee, his own cornermen, commission officials and ringside doctor looked on. Collins was floored seven times in a brutal 3rd round, and the fight should have been stopped after the 3rd knockdown as Collins, his left eye closed, clearly had no idea what was going on. Collins should never been allowed out for the 4th round, and Carter was obviously unhappy about it. He was reluctant to hit him again and kept looking at the referee Tommy Rawson in the hope that he would call a halt. When he did nothing he knocked the youngster down three more times.Even that was not enough for Rawson who was preparing to order them to box on when Collin’s manager and second at last jumped into the ring to signal their man’s surrender. 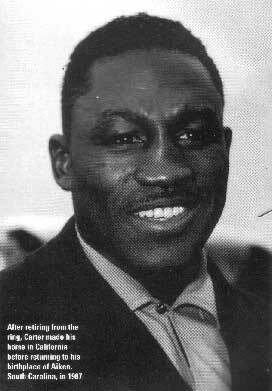 Carter’s next defence was against George Arujo in June 1953. Arujo had earned his title shot with wins over Sandy Saddler and paddy De Marco, but had the misfortune of find the erratic Carter on top of his form and the champion stopped him in 13 rounds. Ever unpredictable Carter lost his next fight, a ten round decision to Johnny Cunningham, a little known welterweight who boxed to supplement his wages as a garbage collector. It was a worrying result for Carter, but he got back in form with two quick non title wins before risking his title again, against Armand Savoie in November 1953. Like Carter , the Canadian Savoie was a hot and cold fighter whose record was littered with surprising losses mixed in with brilliant victories. For three rounds of his championship challenge it seemed that Savoie was having one of his good nights as he speared carter with long jabs and stepped in with short hooks to the head. But Carter began to find his range in the fourth and ended the fight with a single, dramatic straight right to the chin in the fifth. Savoie crashed on his back and had only managed to make it to his hands and knees when he was counted out. 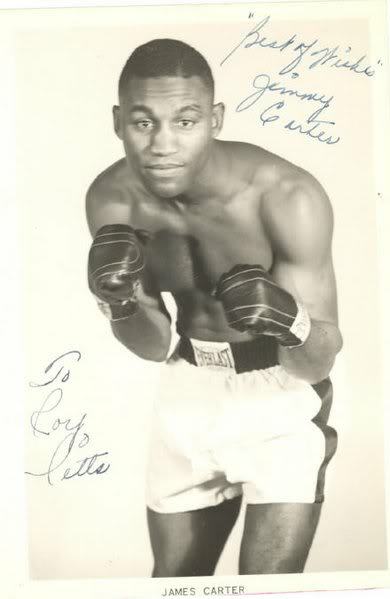 Carter opened 1954 with a trip to the Bahamas where he outpointed Billy Lauderdale, before defending in New York City against Paddy De Marco in March. Carter started as a 4-1 favorite, but De Marco chased him around the ring for 15 rounds and took a unanimous decision as the lethargic champion relied almost exclusively on his left jab. Carter had a return bout clause in the pre fight contract, but after being originally scheduled for June the fight was twice postponed due to De Marco injuring an elbow in winning the title, The two men finally met in November 1954. De Marco built up a lead in the first five rounds but from the sixth Carter found his range and raised a swelling on the champs left eye. A left hook floored De Marco in the ninth, but he rallied to open a cut on Carter’s right eye in the 10th. De Marco was floored twice in the 14th and had nothing left when he came out for the 15th. The final round lasted just 14 seconds as De Marco was battered across the ring and the fight was stopped. Carter was champion again for the third time. However the good times were almost over for Carter. He began his third reign with a 10 rounds points win over bobby Woods, but was held to a draw by Tony De Marco ( no relation to paddy ) and beaten on a decision by the Cuban Orlando Zulueta. It was all poor preparation for his next defence against Wallace bud Smith in Boston in June 1955. Smith , a former USA amateur champion and 1948 Olympic Games semi finalist, was a much improved fighter from the youngster who had lost to Carter in 1950. Carter had the best of the early rounds, but Smith caught him repeatedly with short slashing left hooks in the latter stages to take a split decision. The return fight in Cincinnati ,in October, where 7,000 fans got full value for money, with the outcome in doubt all the way.Smith was just ahead after 12 rounds, having cut Carter’s right eyelid in the 3rd and closed his right eye in the 8th. However the challenger made his big effort in the 13th and pounded the weary Smith around the ring. Smith managed to stay on his feet, even though he had to use the ropes to keep him upright, and then boxed his way out of trouble in the last two rounds to take a unanimous decision. Carter set about earning another championship chance, but his campaign took a knock when Cisco Andrade took a split decision in his first outing in 1956. Carter came back with a win over Phil Burton, and then had a series of three victories over Don Jordon, Art Aragon and Lauro Salas. When Carter faced 20 year old Larry Boardman in September he was virtually assured of a crack at new champion Joe brown if he won. Boardman had beaten Bud Smith and Sandy Sadler in the space of nine weeks, and also held wins over paddy de Marco and Frankie Ryff. The youngster proved too lively and ambitious for the veteran and Carter was floored three times before being stopped in the 8th.